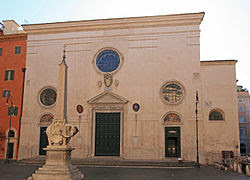 The church of Santa Maria Sopra Minerva is located at the rear of the Pantheon on the Piazza dela Minerva. I have to admit that when I first visited the Pantheon, I approached it through this street. I immediately noticed Bernini's "Little Chick", the playful elephant carrying an obelisk on its back in the piazza but I completely failed to notice the church as my attention was focused entirely on the Pantheon. In my defense, the facade of this church is so innocuous that I did not even realize it was a church, much less a minor basilica. When I did notice that this was a church, on my second visit to the Pantheon, I still didn't enter although I was intrigued by its name. I was later to find out, that this church located as it is in the ancient Field of Mars was erected atop a temple built by Pompey, the Minervium, dedicated to the goddess Minerva, hence the Sopra Minerva (on top of) part of the name. In Roman times, this area had in addition to Minerva's temple, 2 other temples, one dedicated to the goddess Isis and the other to the god Serapis. I know a little bit about the Greek goddess Minerva and the Egyptian goddess Isis, but Serapis? 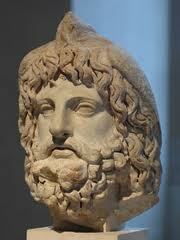 A reference to Serapis as an "invented god" had me looking him up. Serapis, a god combining egyptian god Osiris and the egyptian sacred bull Apis was introduced by Ptolemy I Soter of the Ptolemaic dynasty (The dynasty started by a greek general of Alexander the Great who made Alexandria the capital of Egypt, in essence the dynasty of the greek pharoahs), in order to unify the Greeks and Egyptians in his realm. But I digress.. Anyway on a day when attempting to enter the Pantheon covered as it was with wall-to-wall tourists, would have been foolhardy, I found myself finally entering this church. And what is it they say about not judging a book by it's cover? To say that I was surprised would be an understatement! It's plain facade belies the size and the richness within. When I entered my eyes were immediately drawn to the vaulted ceilings of a brilliant blue with golden stars bordered by vivid red ribbings. To the left of the main altar, stands Michelangelo's Christ Bearing the Cross. The incongruous nature of Christ's bronze loincloth on the statue can be attributed to the Vatican's "fig leaf campain" to cover genitalia and nakedness in all works of art during the Counter Reformation. Under the main altar is the tomb of St. Catharine of Siena, over which there is an effigy in her likeness. The remains of St. Catharine entombed here is incomplete as her head is interred in Siena. In this church also lie the remains of another, uncorrupted and canonized saint, whose name unfortunately I cannot recall. I took a picture of her because she was supposedly an ordinary housewife. Most of the saints I had heard of were popes, priests, monks, nuns, or martyrs, so it was nice knowing that an "ordinary" housewife is now in the august company of those other saints! Also buried here are popes, one of them is Leo X, whose tomb is behind the main altar, under which is the burial place of St. Catharine of Siena. Not to be missed is the Carafa chapel which contains Filippino Lippi's fresco of the Assumption. I looked at this for a long time, contributing several Euros to keep the chapel lighted up, the only way one can see this magnificent fresco in its entirety. The lower portion of the fresco shows Pope Paul IV being presented to the Virgin Mary by the great theologian St. Thomas Aquinas. Ironic I think since this Pope, a religious zealot is credited with setting up the Roman inquisition, creating the Roman jewish ghetto and instituting the index of Forbidden Books. The top portion of the fresco is a representation of the Assumption of our lady. On the side of the chapel is another fresco by Lippi of St. Thomas Aquinas, entitled Glory of St. Thomas. In the chapel of the Annunciation, there is also a fresco depicting the Virgin Mary handing white purses to three girls, a depiction of the Dominican's (the order of preachers that run this church) charity work at the time, of providing dowries for impoverished young women. In another side chapel one finds a very lovely Madonna and Child painting by Benozzo Gozzoli, an Italian renaissance painter. Just before I left the altar area, I took this picture of the right aisle leading to the doors of the church.